Barnacle Press » The Adventures of Kitty Cobb! The Adventures of Kitty Cobb! Hopefully you enjoyed Gibson’s full length tale a few days ago; this time around we have one from our ol’ pal James Montgomery Flagg. 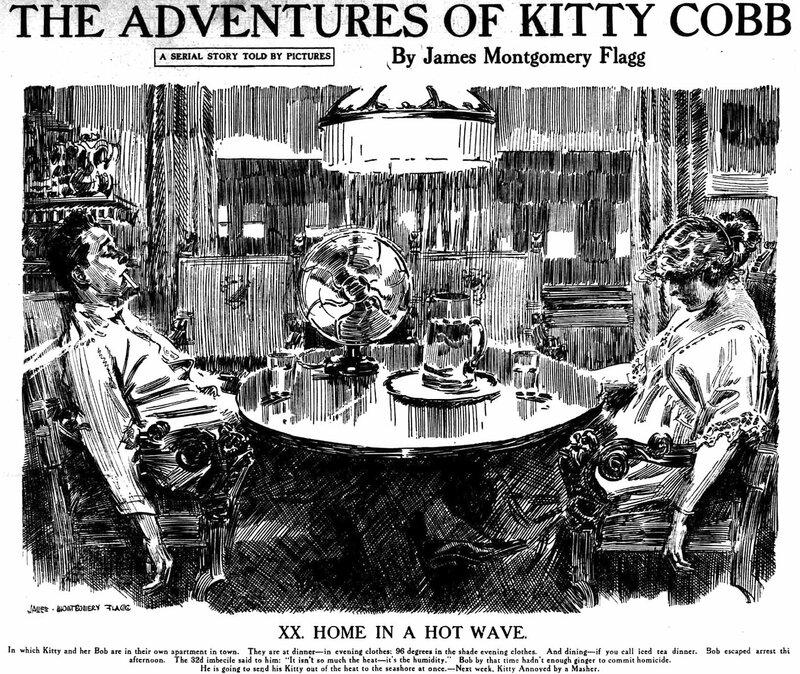 Like A Widow and Her Friends, The Adventures of Kitty Cobb was published in book form and subsequently became a special weekly feature in newspapers across the land. It’s the exciting tale of a small town girl going to the big city, or as an ad for the book touts, “[Mr. Flagg] tells, by means of thirty-one inimitable pictures and short descriptive legends, a delightfully humorous and tender love-story.” For some odd reason the paper from which I culled our run, The Washington Herald, chose to re-write the captions for many of these; I can’t help but wonder why they decided to go this route as the new text is a big step down from the original material. Compare the Sanford & Son(!) outings from the Herald to the original nos. IX and X to see what I mean. As well, the Herald stops running the story at no. XXV; far be it from me to question the wisdom of a newspaper editor from 101 years ago, but why not just see the thing through if you made it that far?! I’ve cheated and collected the final episodes under names that reflect the dates they should have appeared. Start here and enjoy!